With Sakic's back in bad shape, Avalanche fans are now receiving some news regarding the future of the club. 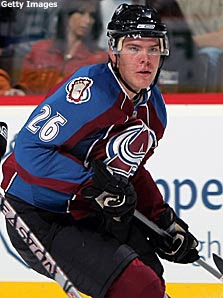 The Colorado Avalanche Hockey Club announced today that it has signed 22-year-old center Paul Stastny to a five-year contract extension beginning with the 2009-2010 season. Adrian Dater is reporting that it is a 5 year, 33 million dollar (6.5 per season) deal. Great news on a Monday without Avalanche hockey. His salary replaces Sakic's when Joe decides to retire. The deal is actually a little less than Anze Kopitar's 6.8 million per season deal. The Avs got a good price for their new franchise player.